TOJ Team Wins International Award! Paul Rothberg and Marshmallow from Newington, CT are one of just four Pet Partners (therapy animal) teams being honored as winners in the international Delta Society Beyond Limits Award sponsored by Purina. Honorees were chosen from over ten thousand registered Pet Partners teams representing 13 countries. Delta Society Pet Partners are specially trained volunteers who with their pet (cat, dog, rabbit, llama, etc.) dedicate themselves to helping improve the lives of others in their communities. They visit hospitalized patients, seniors in assisted living centers, comfort people in hospice, help children learn to read and so much more. 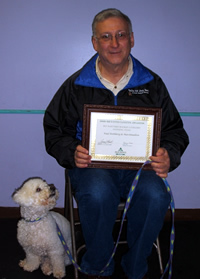 Paul Rothberg and his Bichon Frise, Marshmallow, recently won the Rookie category which recognizes Pet Partners with one to two years of experience. According to their many fans, Paul and Marshmallow are a true Pet Partners team. The two started visiting nursing homes when Paul’s mother-in-law was forced to transition to an assisted living facility. 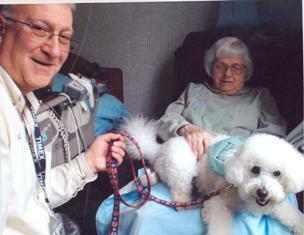 After a few visits, Paul and Marshmallow joined a local Delta Society affiliate group called Tails of Joy so they could bring cheer and healing to other residents. They now visit two nursing homes and one hospital regularly. "Paul and Marshmallow do a wonderful job bringing cheer, hope and healing to the patients, visitors and staff as they make their rounds,” says Kelley Boothby, Volunteer Services Manager at Hartford Hospital. Please join us in congratulating and thanking Paul Rothberg and Marshmallow on receiving this special award and for all that they do to bring joy, compassion, motivation and inspiration to many people in your community! Delta Society, an international 501(c)(3) non profit, was founded in 1977 by a veterinarian and a psychologist who observed in their own practices that pets had a positive effect on their human patients. They started the organization to fund some of the first credible research which proved that animals have a profound impact on people’s health by lowering their blood pressure, reducing stress and anxiety levels, stimulating the release of endorphins which make people feel good, and so much more. Today, Delta Society helps people across the world become healthier and happier by experiencing the benefits of having companion, service and therapy animals in their everyday lives. To learn more visit our website at www.deltasociety.org. Nestlé Purina PetCare promotes responsible pet care, community involvement and the positive bond between people and their pets. A premiere global manufacturer of pet products, Nestlé Purina Pet Care is part of the Swiss based Nestlé S.A., the world’s largest pet food company.